Playing catch with the Slip Disc allows you to CONNECT with someone’s life. And when you CONNECT, you can share the Gospel which is clearly printed on the underside of the discs. Choose From Five Messages in Ten Languages. A cool logo on the top – The Gospel on the underside decal. Available in English, Spanish, Russian, Romanian, Portuguese, Haitian Creole, French, Ukrainian, and more. Because of the high quality and flight characteristics, the disc is guaranteed to get tossed but never into the garbage. And each time it is tossed, someone is likely to check out the underside message explaining God’s love and forgiveness. Evangelism without the stress. We call this “Ministry Mileage”. 5 -24 =$2.45 ea, 25+= $2.35, 100+ = $2.25 ea, 200+ = $2.15 ea, 500+ = $2.05 ea, 2500+ = $1.95 ea. Available by phone (800-438-1026) or EMAIL order only for $1.99 ea. plus shipping. You can get a mix of messages and languages. 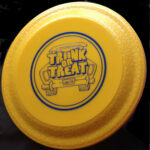 Most customers order the discs with the standard SLIP DISC logo. However, many find that customizing is helpful in reaching their target audience. Don't have a logo? We would be happy to design one for your outreach needs at an affordable price. Call for details! 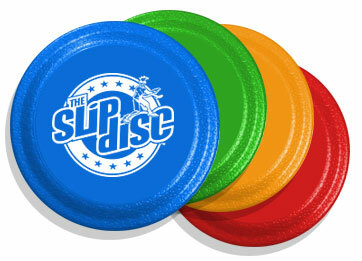 The Slip Disc has been used in 75 countries & nearly every state. Perfect for mission trips, evangelism, outreach, kids & youth events, and available in many languages. Read stories of how the original flying gospel tract is changing lives! Fun is a Universal Language. Simply have some good old fashioned fun, and soon you will find it easier to talk about things that are much more important... God's love and forgiveness. With the Slip Disc, the Gospel is explained on the underside of the flying disc. You can choose any of the 5 messages available in 10 languages.